BMW aims to expand the appeal of e-bikes via its Vision E3 Way, an elevated and covered path designed to make travel on two wheels safer and less exposed to the elements. Although car sales are still rising, chronic traffic congestion in China’s megacities is forcing some municipalities to restrict people from both buying cars and using them. This has forced automakers such as BMW to innovate. “Growth in the future won’t come from building and selling cars but from other services,” said Thiemo Schalk, who manages BMW’s Center of Urban Mobility Competence in Berlin. Some ideas can be copied from Europe and other markets. For example, BMW recently launched its ReachNow car-sharing scheme in the city of Chengdu, starting with a fleet of 100 i3 electric cars as the company investigates whether to expand the service to other Chinese cities. BMW, however, knows that it needs additional mobility solutions in China so it has asked its advanced research department in Shanghai for help. The team, which works in an office tucked away in the leafy streets of the city’s old French Concession district, has been asked to take BMW into areas where no car company has ventured before. 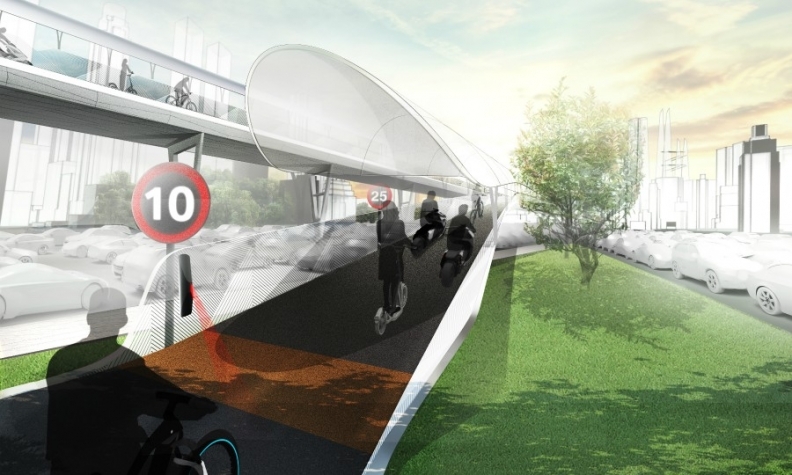 A good example is the Vision E3 Way, an elevated and covered electric-bike path concept BMW has devised together with Shanghai’s Tongji University. Electric bikes account for about 20 percent of journeys in Shanghai because they are often quicker than driving or public transportation. The problem is that biking in the city can be dangerous because of the dense traffic or impractical if the weather is bad. These and other factors limit the use of bikes predominantly to the working classes. BMW aims to expand the appeal of e-bikes to its more affluent users by making travel on two wheel safer and less exposed to the elements. For these advantages, users would pay a toll to use the bike path. “A new criterion for premium mobility is travel efficiency, which will become more significant,” said Dandan Wang, who is a BMW project manager for future urban mobility. Travel efficiency is already third on the list of BMW customer needs after safety and brand, company figures show. BMW doesn’t expect to help build the path, or even have exclusive use of the planned e-bike rental stands situated near its on-ramps. But it does make e-bikes and it also holds 20 patents on various elements of the Vision E3 Way concept that could provide a revenue stream should a municipality decide to build it. BMW is also working to make carpooling more appealing. The automaker is developing an app to help match drivers and riders. “The perception right now is that carpooling is low cost. We’re trying to make it more premium,” said the head of BMW’s advanced research department in Shanghai, Markus Seidel. The project involves mining customers’ phones for GPS data to establish their daily travel patterns, encrypting that data and sending it out to try and match it with others. The second step is to treat the data the same way that a dating app would so that participants are matched with people who share similar interests. Ride-hailing is another technology that is growing fast. China’s answer to Uber, Didi Chuxing, now achieves an astonishing 25 million rides a day in the country, according to Didi’s data. BMW hasn’t included ride-hailing within its Chengdu ReachNow service, and it’s difficult to see how it can compete. However, Seidel and his team are working to figure out what premium customers of future BMW autonomous robotaxis or personal cars might want. His vision incorporates elements of an airplane’s business-class cabin, complete with automated flight attendants. What that means is the car could be designed to serve passengers, such as making coffee using a robot arm that responds to voice commands. Many automakers also have expressed a wish to generate more income from autonomous cars by getting riders to interact with its own infotainment systems, but Seidel is skeptical. “It will be very hard to get people off their phones,” he said. Instead, BMW is looking to develop virtual reality games that use the movement of the car, providing it can solve the problem of motion sickness.